Heya Matt, here’s another one to add to your list: the Bar Campfire blog is now on WordPress.com. And don’t forget, tonight is the kickoff for Bar Camp Austin! Blog it, share it, spread it — it’s going to be a crazy time. I mean, we’ve got a press release — how easy can it be? 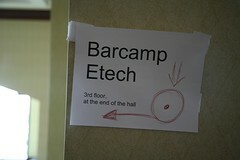 Before leaving ETech today, I stopped by Bar Camp Etech set up at the last minute… dude.